Includes 11 courses for $399/year. CFCs and HCFCs are being phased out due to their high Ozone Depletion Potential (ODP) and high Global Warming Potential (GWP). 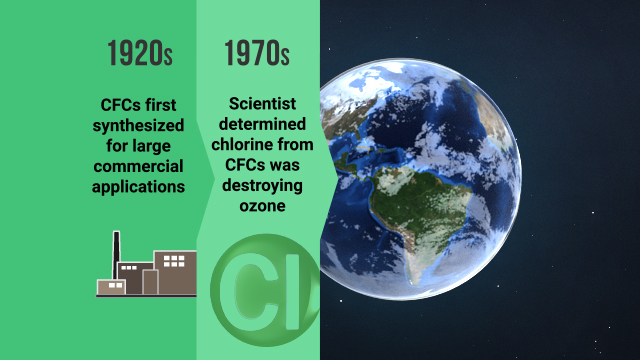 Chlorine from CFCs that has accumulated in the upper atmosphere is destroying ozone that protects us from harmful UV radiation. 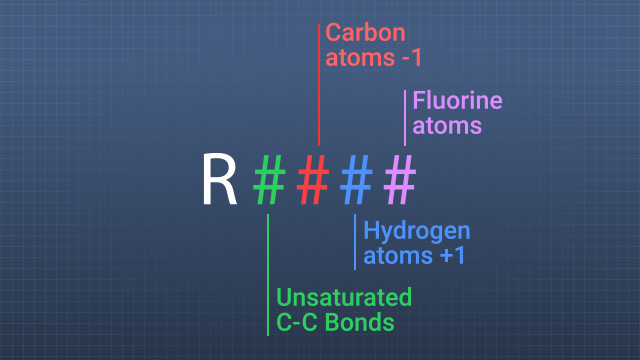 Refrigerant ID numbers can be used to determine the composition of the refrigerant chemical. 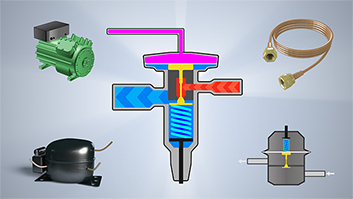 Several factors influence refrigerant selection, including: physical, chemical, and thermodynamic properties of the refrigerant; compressor design and system capacity; and stability, toxicity, reactivity, and environmental impacts of the refrigerant. 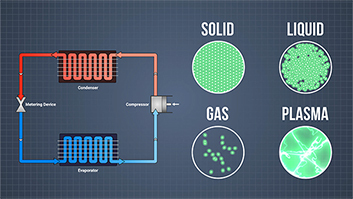 This module discusses the properties of and differences between CFC, HCFC, HFC, HFO, and natural refrigerants. It also explains refrigerant numbering, safety classifications, compatibility with equipment and lubricating oil, and safety guidelines. 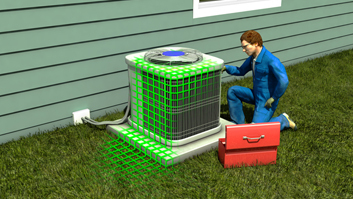 Why are CFC and HCFC refrigerants being phased out? 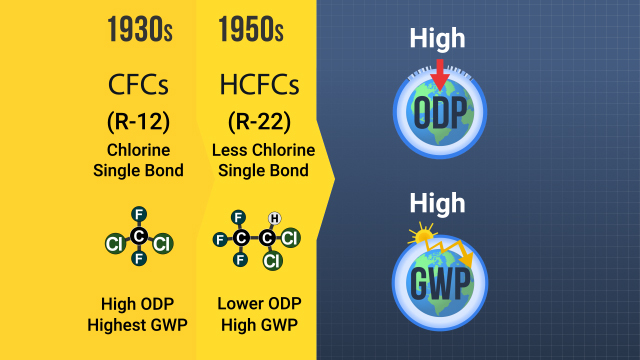 CFCs and HCFCs are being phased out because they have both high Ozone Depletion Potential (ODP) and high Global Warming Potential (GWP). What is Ozone Depletion Potential, or ODP? ODP indicates a refrigerant's ability to destroy ozone in the Earth's upper atmosphere, relative to the ozone-destroying ability of trichlorofluoromethane (R11). 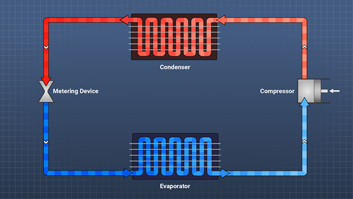 What is Global Warming Potential, or GWP? 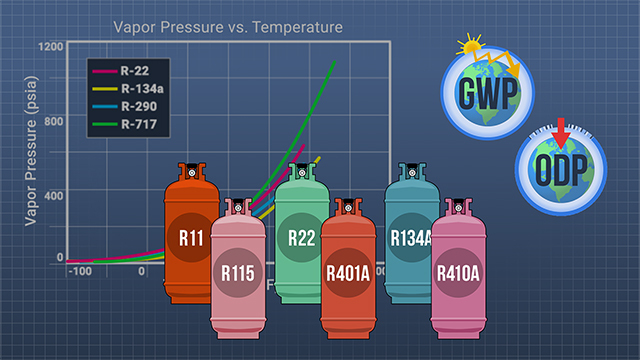 GWP indicates a refrigerant's ability to trap heat in the Earth's atmosphere for a specific time period (usually 100 years), relative to the heat-trapping ability of carbon dioxide. 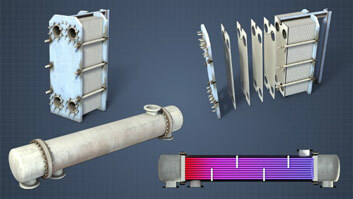 HFO stands for hydrofluoro-olefin. These refrigerants are made up of hydrogen, fluorine, and carbon, and they contain a carbon-carbon double bond. Can any naturally-occurring substances be used as refrigerants? Yes, hydrocarbons like propane and isobutane, carbon dioxide, ammonia, and even air are used as refrigerants. Three common types of refrigerants are: •	Chlorofluorocarbons, or CFCs, which contain chlorine, fluorine, and carbon •	Hydrochlorofluorocarbons, or HCFCs, which contain hydrogen, chlorine, fluorine, and carbon •	Hydrofluorocarbons, or HFCs, which contain hydrogen, fluorine, and carbon CFC and HCFC refrigerants were widely used in the 20th century because they are relatively inert, nonflammable, and nontoxic, which made them much safer than early refrigerants, like ammonia (NH3), sulfur dioxide (SO2), and methyl chloride (CH3Cl). However, CFCs and HCFCs are being phased out because it was discovered that they have both high Ozone Depletion Potential (ODP) and high Global Warming Potential (GWP).